Additional info: Guest review by Anthony Farthing, Tavistock and Portman NHS Foundation Trust. In number XXV of his Introductory Lectures on Psycho-analysis, Sigmund Freud described anxiety as ‘a riddle whose solution would be bound to throw a flood of light on our whole mental existence’. 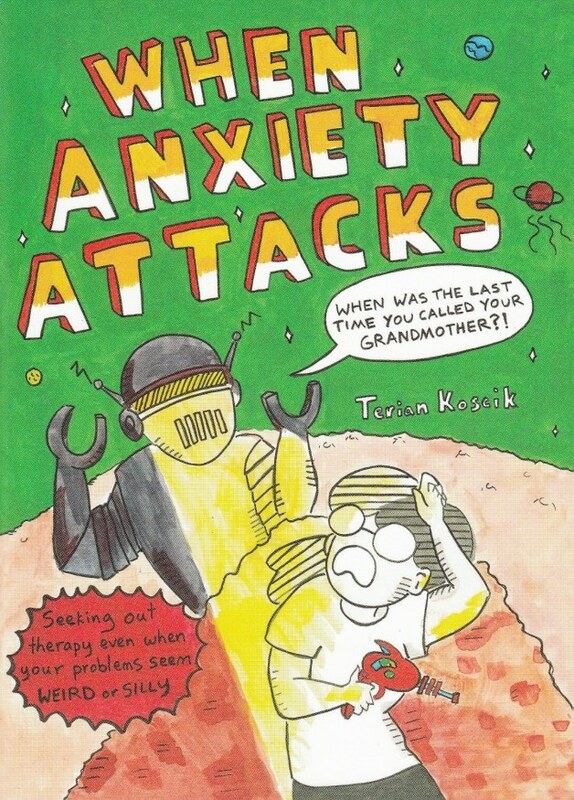 While Terian Koscik’s new autobiographical comic, When Anxiety Attacks, has the more modest ambition of depicting her personal experiences of anxiety, she does succeed in giving an illuminating account of a condition for which she can testify there are no easy answers. The cover’s science-fiction scenario and punning title hint at the humour that underpins the storytelling, but belies the book’s concern with how small, everyday events can trigger unhelpful and consuming mental processes. The vivid colouring and B-movie styling of the cover do not find their way on to the pages inside, with Koscik mainly using a palette of black and grey, plus a sparse employment of colour washes (mainly red) of varying intensity. The drawing style is economic but charming, with the author’s avatar proving an engaging and sympathetic narrator. Koscik is painfully aware that her behavioural responses are damaging, but she’s unable to exercise control of them with reason. As contradicting thought bubbles battle for dominance, or undermine verbal exchanges with other characters, the extent of her turmoil is revealed. Although a flashback to Koscik’s childhood demonstrates that anxiety has always been a feature of her mental make-up, there is no attempt at psychoanalytic exploration. Nor are there any neuroscientific or biological explanations of the processes involved. When treatment is sought, her therapist focuses on how to use mindfulness techniques to deal with anxious thoughts and prevent them from becoming overwhelming. These are simply but effectively illustrated, providing a short but significant self-help element to the narrative. Koscik’s realisation that she can reach out for help is a pivotal point in the book, and a primary motive for its creation. The cover contains the strapline ‘Seeking out therapy even when your problems seem weird or silly’, and the book sends a clear message to readers debating whether to seek therapy that help is available and, more importantly, that they deserve to receive it. This comic is not about existential anxiety or grand drama – despite the protagonist’s impulse to catastrophise. Instead, the reader gets an evocative expression of how, for those of an anxious disposition, deep distress and loneliness can arise from seemingly mundane exchanges. And while an all-encompassing cure is not on offer, Koscik emphasises there are methods of communication and control that have put her on a path to self-acceptance, and that they might well prove effective for others who are facing similar problems.